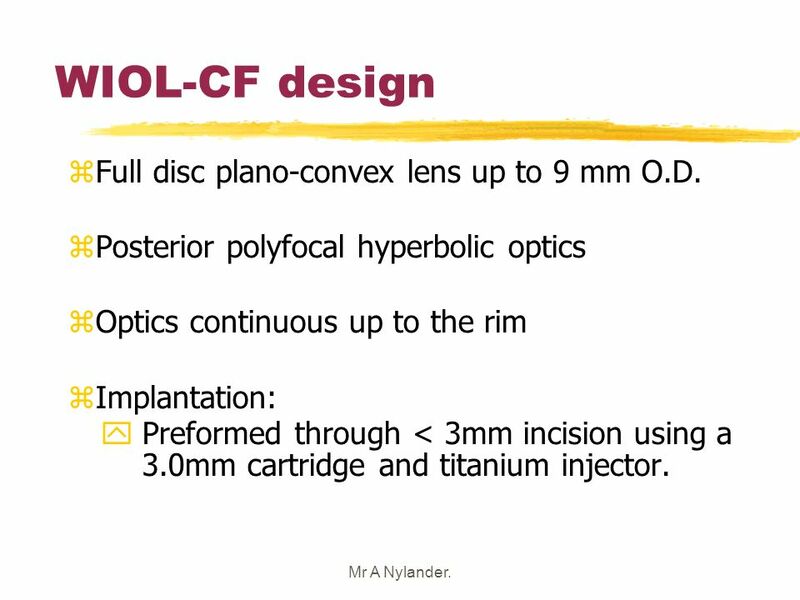 Clinical Experience with the Accommodative WIOL-CF acrylic IOL. 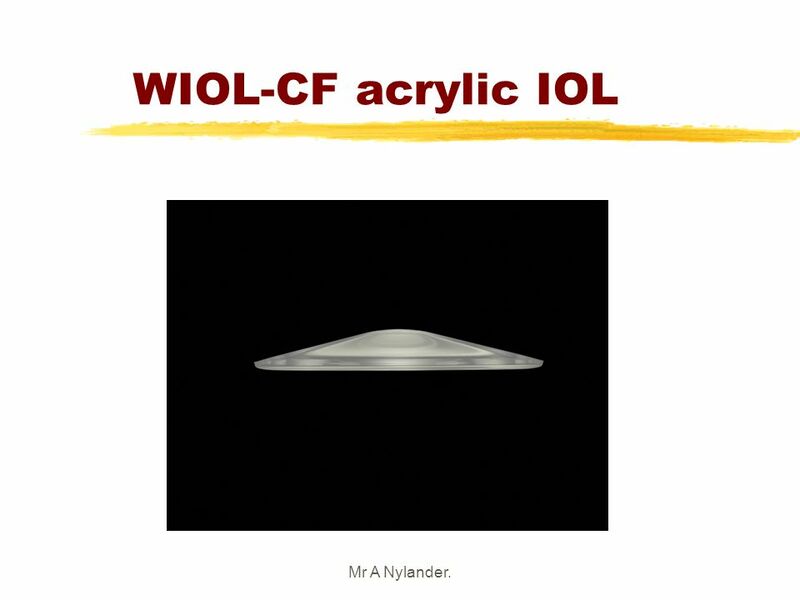 1 Clinical Experience with the Accommodative WIOL-CF acrylic IOL. 3/25/2017 Clinical Experience with the Accommodative WIOL-CF acrylic IOL. By Arthur Nylander, FRCS, FRCOphth, D.O. Consultant ophthalmologist East Lancashire hospitals, Lancashire, U.K. The author as no financial interest in these products Mr A Nylander. 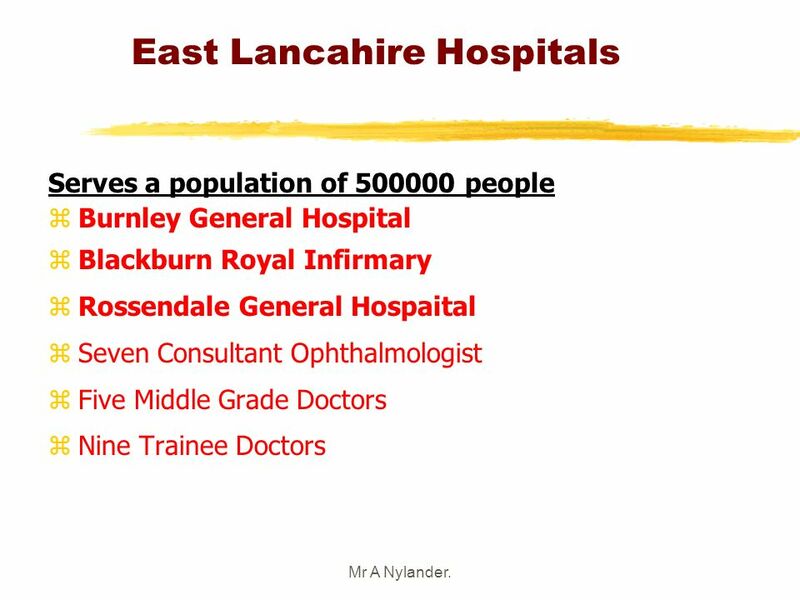 3/25/2017 East Lancahire Hospitals Serves a population of people Burnley General Hospital Blackburn Royal Infirmary Rossendale General Hospaital Seven Consultant Ophthalmologist Five Middle Grade Doctors Nine Trainee Doctors Mr A Nylander. 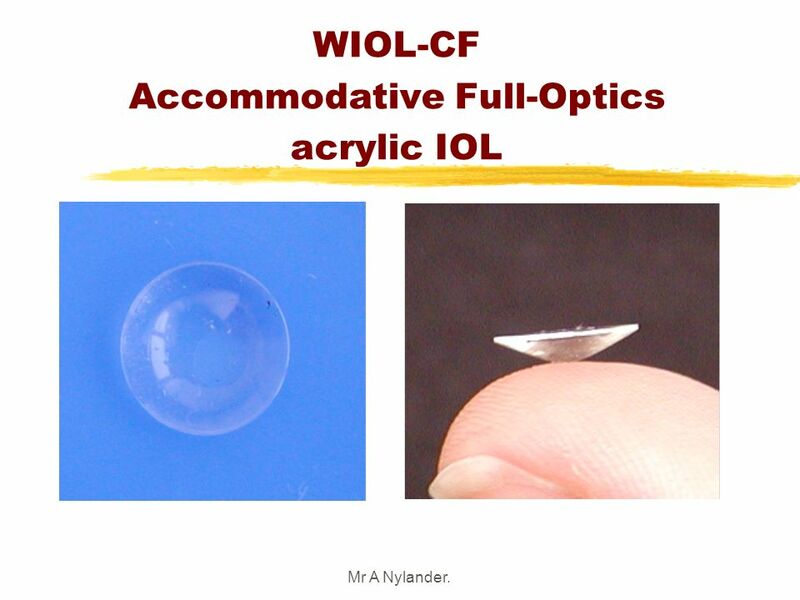 3/25/2017 WIOL-CF Accommodative Full-Optics acrylic IOL Mr A Nylander. 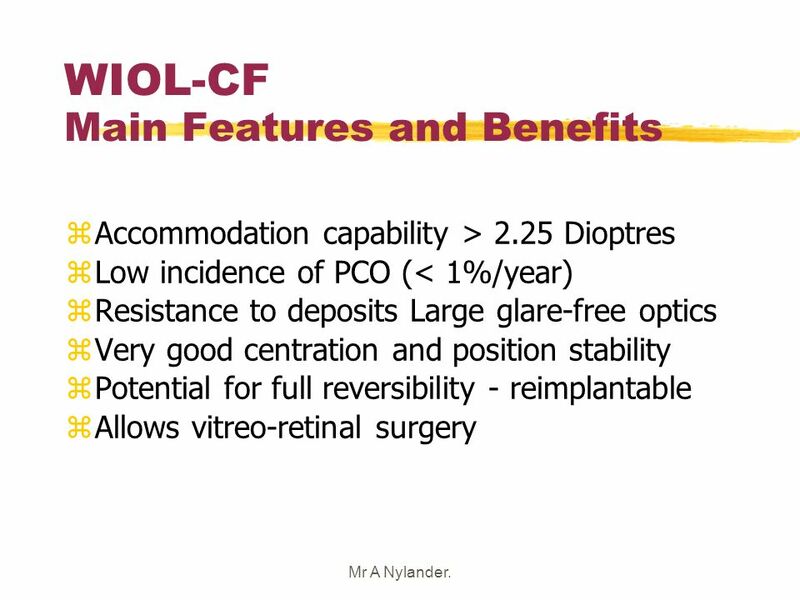 3/25/2017 WIOL-CF Main Features and Benefits Accommodation capability > 2.25 Dioptres Low incidence of PCO (< 1%/year) Resistance to deposits Large glare-free optics Very good centration and position stability Potential for full reversibility - reimplantable Allows vitreo-retinal surgery Some clinical results will be presented in the second part. Let me summarize the main reasons why we are interested in this lens: Mr A Nylander. 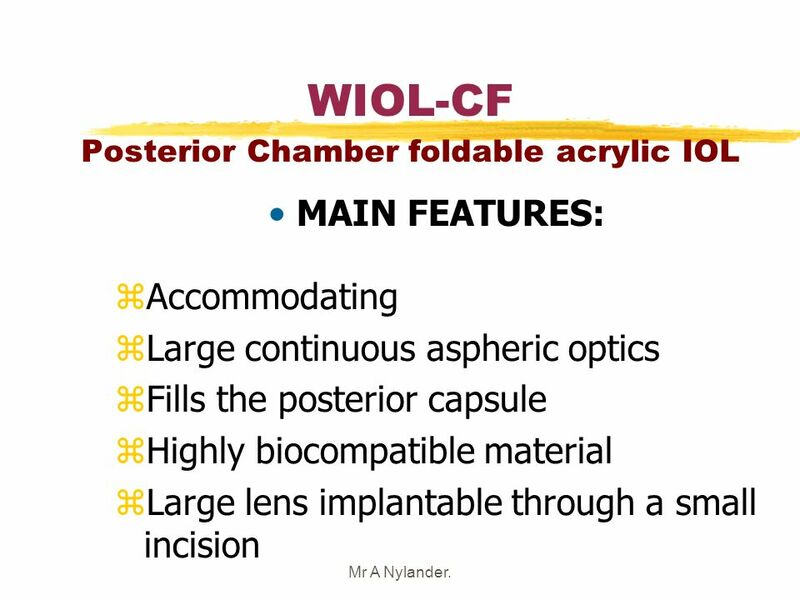 3/25/2017 WIOL-CF Posterior Chamber foldable acrylic IOL MAIN FEATURES: Accommodating Large continuous aspheric optics Fills the posterior capsule Highly biocompatible material Large lens implantable through a small incision This lens has the following main features: Mr A Nylander. 6 WIOL-CF design Full disc plano-convex lens up to 9 mm O.D. 3/25/2017 WIOL-CF design Full disc plano-convex lens up to 9 mm O.D. Posterior polyfocal hyperbolic optics Optics continuous up to the rim Implantation: Preformed through < 3mm incision using a 3.0mm cartridge and titanium injector. Mr A Nylander. 7 3/25/2017 WIOL-CF acrylic IOL Mr A Nylander. 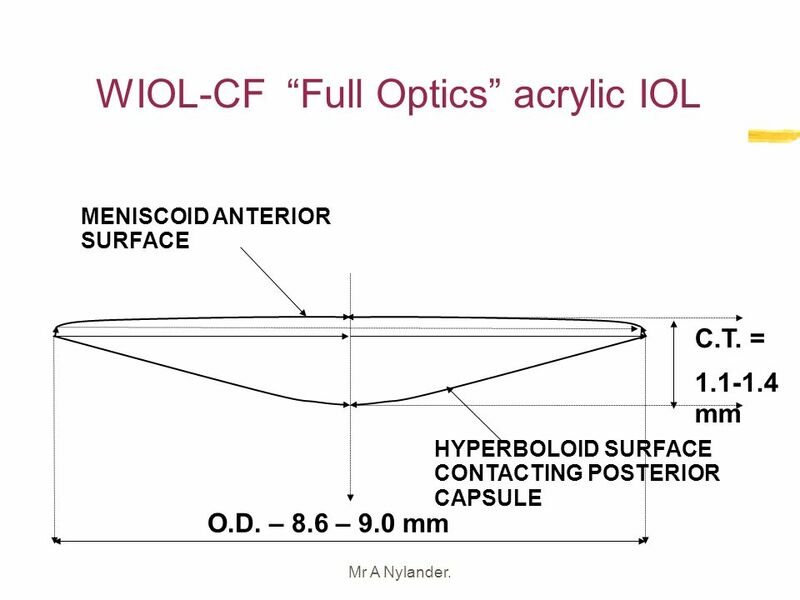 3/25/2017 WIOL-CF “Full Optics” acrylic IOL MENISCOID ANTERIOR SURFACE C.T. = mm The profile shows the posterior surface which a hyperboloid and anterior is a modified spheric surface, or meniscoid. HYPERBOLOID SURFACE CONTACTING POSTERIOR CAPSULE O.D. – 8.6 – 9.0 mm Mr A Nylander. 3/25/2017 WIOL-CF edge profile MENISCOID ANTERIOR SURFACE OPTICAL TRANSITION ZONE CONICAL FASETTE The lens has a sharp rim which then blends into the optical part via a narrow conical fasette. This rim may be one of the reasons why the lens is very resistant to posterior capsule opacification. 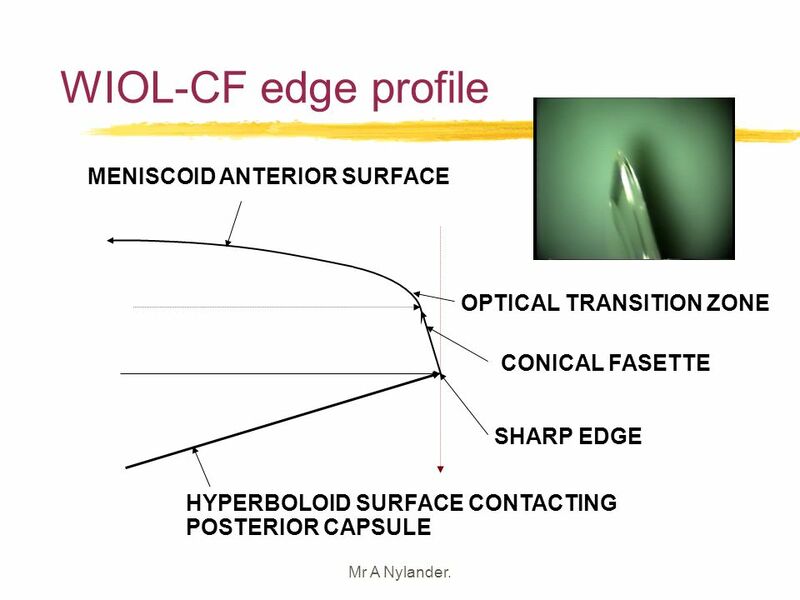 SHARP EDGE HYPERBOLOID SURFACE CONTACTING POSTERIOR CAPSULE Mr A Nylander. 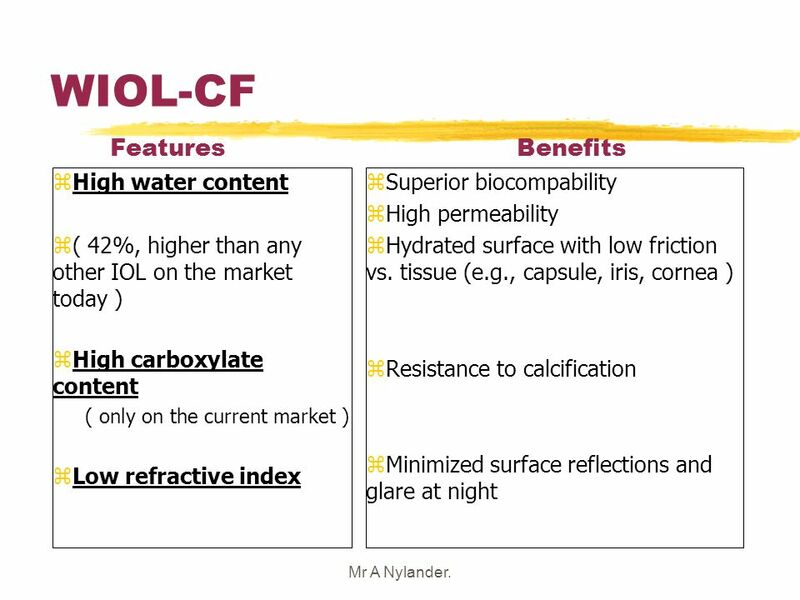 3/25/2017 WIOL-CF Features Benefits High water content ( 42%, higher than any other IOL on the market today ) High carboxylate content ( only on the current market ) Low refractive index Superior biocompability High permeability Hydrated surface with low friction vs. tissue (e.g., capsule, iris, cornea ) Resistance to calcification Minimized surface reflections and glare at night Mr A Nylander. 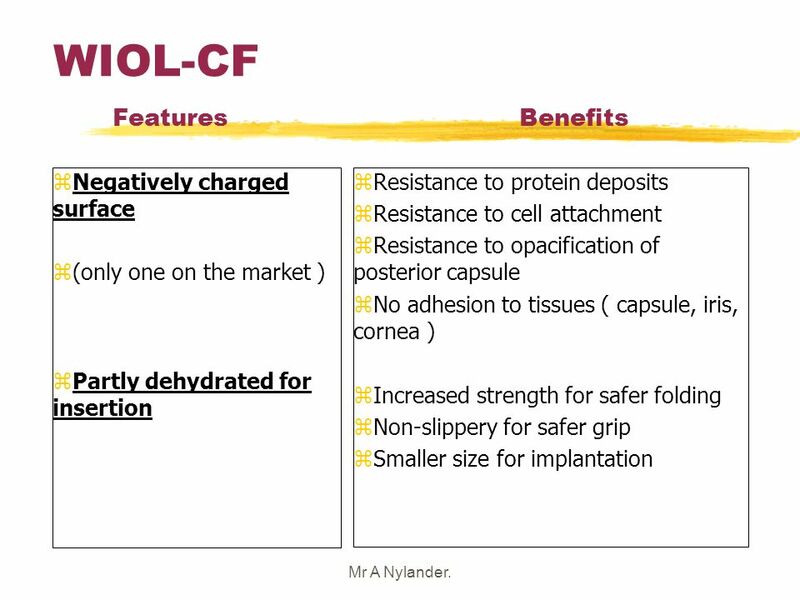 3/25/2017 WIOL-CF Features Benefits Negatively charged surface (only one on the market ) Partly dehydrated for insertion Resistance to protein deposits Resistance to cell attachment Resistance to opacification of posterior capsule No adhesion to tissues ( capsule, iris, cornea ) Increased strength for safer folding Non-slippery for safer grip Smaller size for implantation Mr A Nylander. 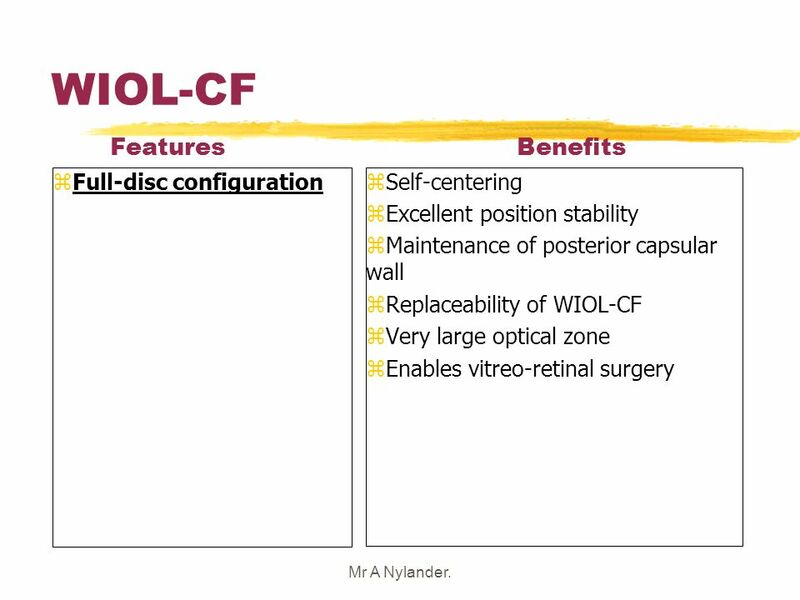 3/25/2017 WIOL-CF Features Benefits Full-disc configuration Self-centering Excellent position stability Maintenance of posterior capsular wall Replaceability of WIOL-CF Very large optical zone Enables vitreo-retinal surgery Mr A Nylander. 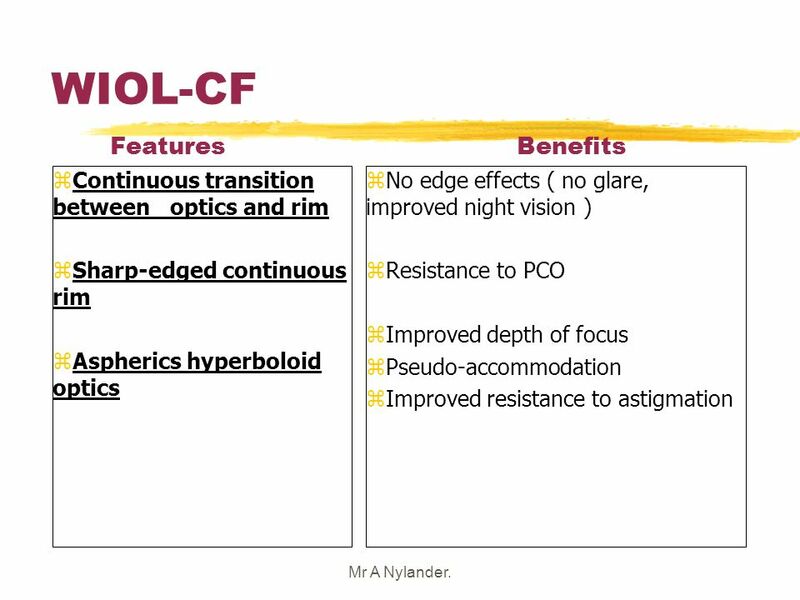 3/25/2017 WIOL-CF Features Benefits Continuous transition between optics and rim Sharp-edged continuous rim Aspherics hyperboloid optics No edge effects ( no glare, improved night vision ) Resistance to PCO Improved depth of focus Pseudo-accommodation Improved resistance to astigmation Mr A Nylander. 3/25/2017 Power Calculation Chart Mr A Nylander. 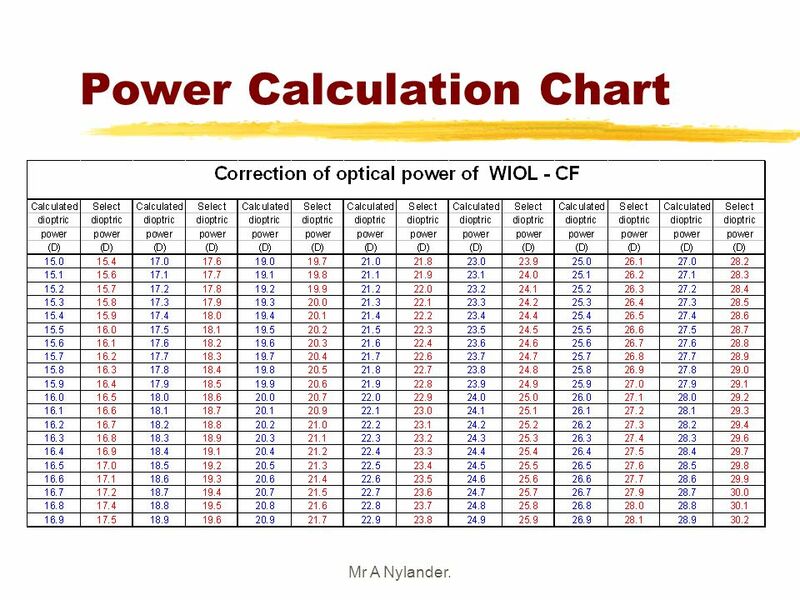 3/25/2017 Power Calculation For the WIOL-CF Lens 1.The surgeon calculates the lens power based on the A-constant for SRK-T. Lets’s assume that the calculated value is 21.5d. 2.Surgeon corrects the calculated value using the correction chart. The value of 22.5d (right red column) relates to the value 21.5d (left blue column). 3.Finally, the value of +0.5d is added to the corrected value. 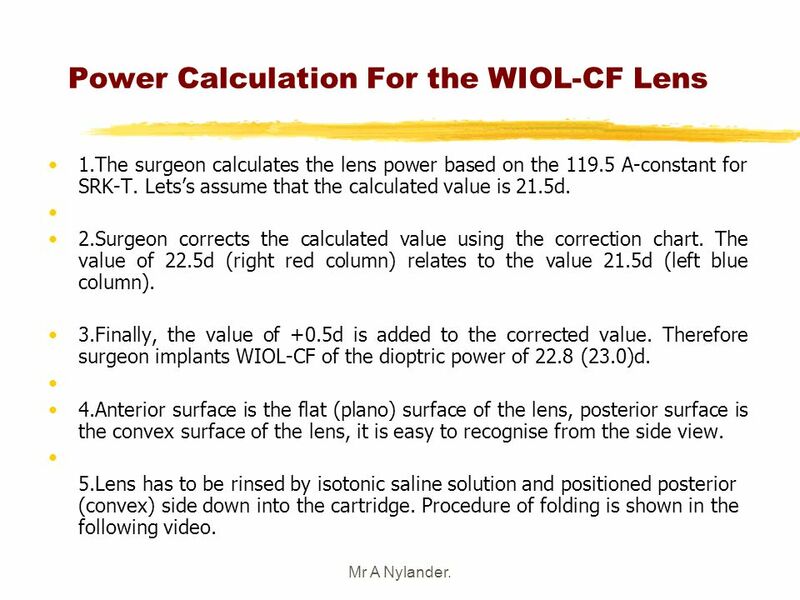 Therefore surgeon implants WIOL-CF of the dioptric power of 22.8 (23.0)d. 4.Anterior surface is the flat (plano) surface of the lens, posterior surface is the convex surface of the lens, it is easy to recognise from the side view. 5.Lens has to be rinsed by isotonic saline solution and positioned posterior (convex) side down into the cartridge. Procedure of folding is shown in the following video. Mr A Nylander. 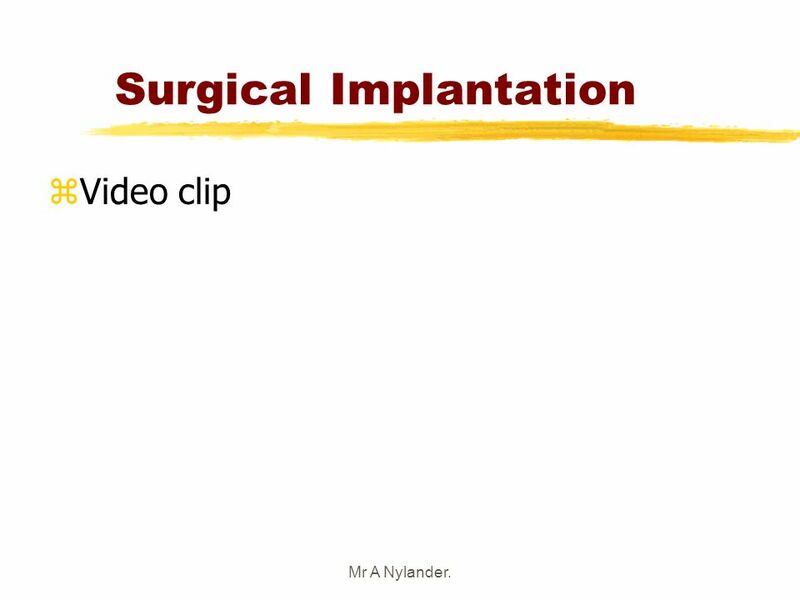 3/25/2017 Surgical Implantation Video clip Mr A Nylander. 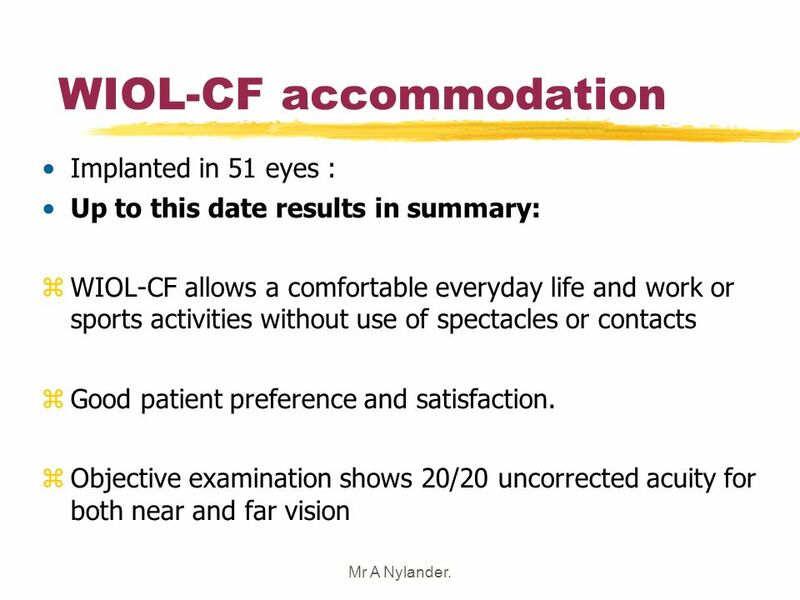 3/25/2017 WIOL-CF accommodation Implanted in 51 eyes : Up to this date results in summary: WIOL-CF allows a comfortable everyday life and work or sports activities without use of spectacles or contacts Good patient preference and satisfaction. Objective examination shows 20/20 uncorrected acuity for both near and far vision Now some personal experience. My right eye was implanted more than 4 yeas ago and my left eye 2 years ago. In summary, this lens allow me a normal active life without spectacles – reading, night driving, sports, etc. Objective examination shows 20/20 vision both for near and far vision. Mr A Nylander. 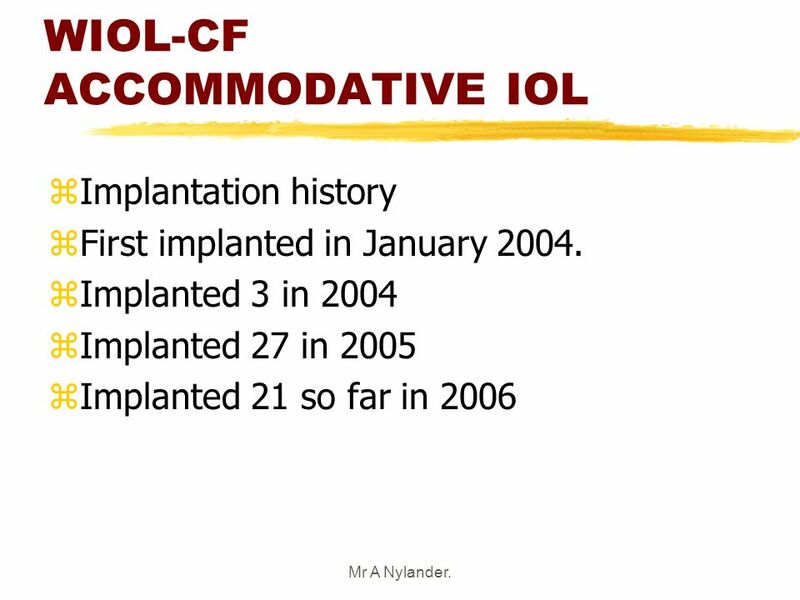 3/25/2017 WIOL-CF ACCOMMODATIVE IOL Implantation history First implanted in January 2004. Implanted 3 in 2004 Implanted 27 in 2005 Implanted 21 so far in 2006 Mr A Nylander. 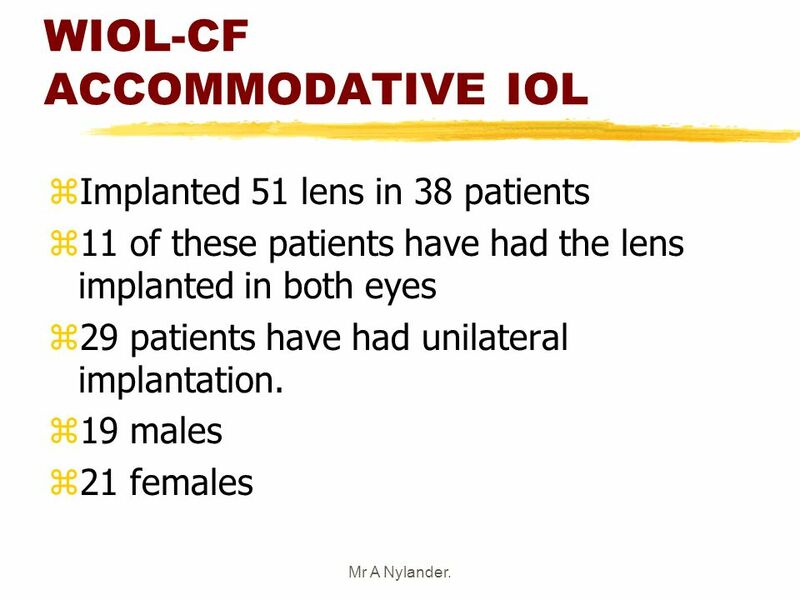 3/25/2017 WIOL-CF ACCOMMODATIVE IOL Implanted 51 lens in 38 patients 11 of these patients have had the lens implanted in both eyes 29 patients have had unilateral implantation. 19 males 21 females Mr A Nylander. 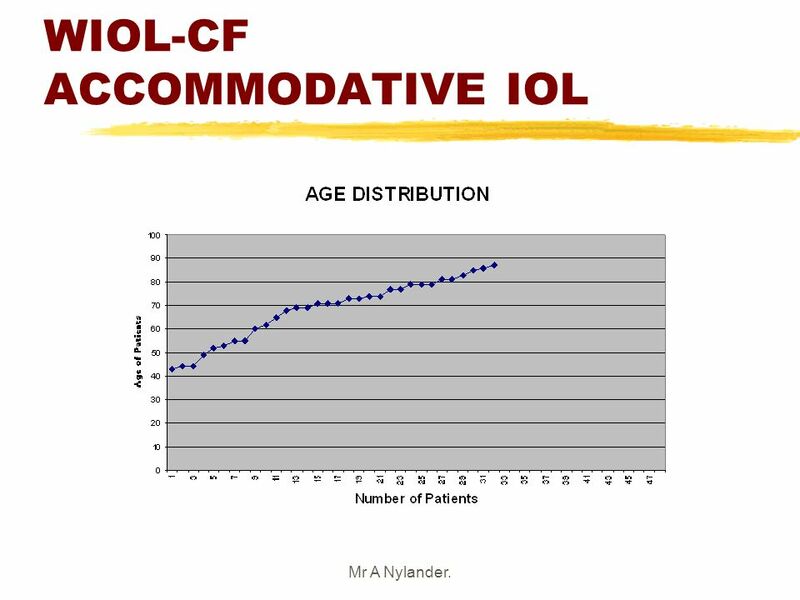 3/25/2017 WIOL-CF ACCOMMODATIVE IOL Age Distribution Youngest Patient 43 years old Oldest Patient 87 years old Mr A Nylander. 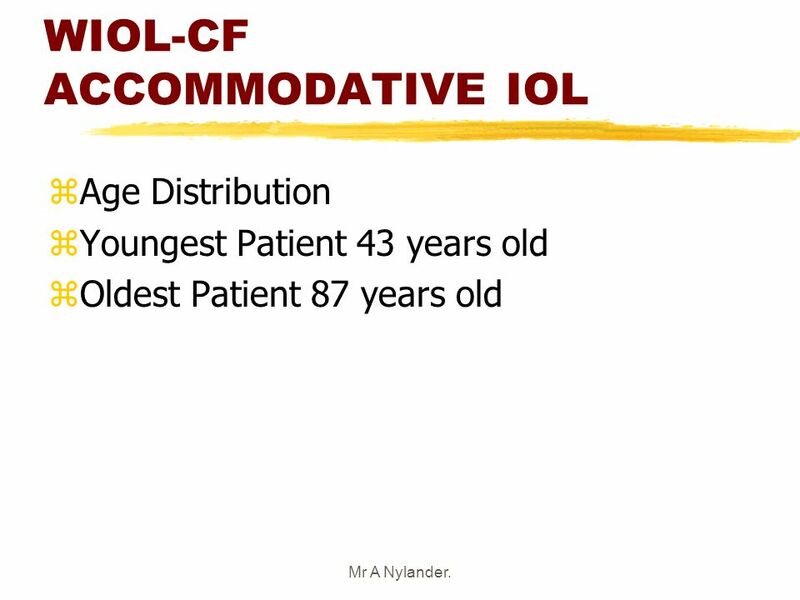 3/25/2017 WIOL-CF ACCOMMODATIVE IOL Mr A Nylander. 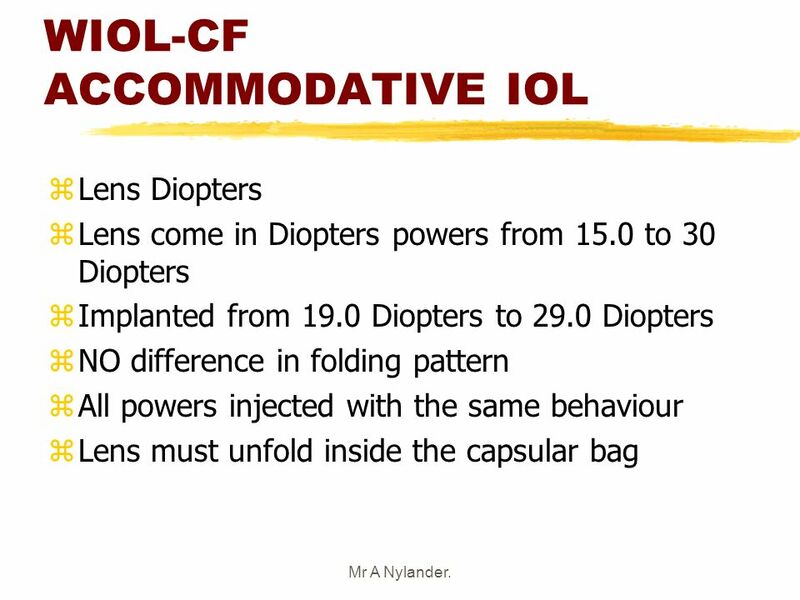 3/25/2017 WIOL-CF ACCOMMODATIVE IOL Lens Diopters Lens come in Diopters powers from 15.0 to 30 Diopters Implanted from 19.0 Diopters to 29.0 Diopters NO difference in folding pattern All powers injected with the same behaviour Lens must unfold inside the capsular bag Mr A Nylander. 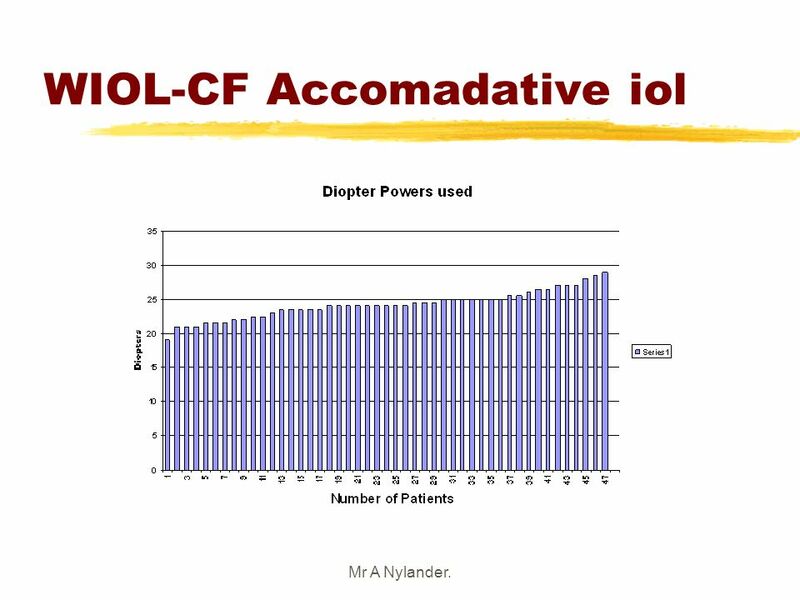 3/25/2017 WIOL-CF Accomadative iol Mr A Nylander. 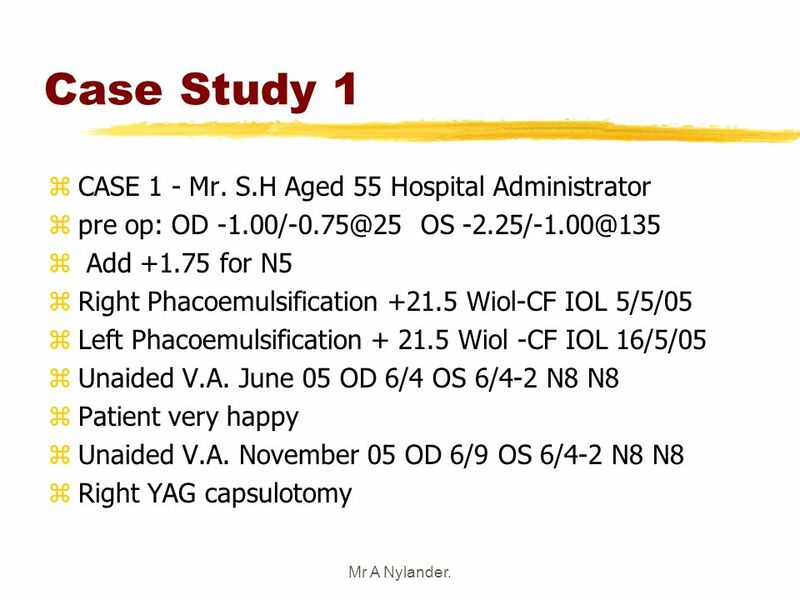 3/25/2017 Case Study 1 CASE 1 - Mr. S.H Aged 55 Hospital Administrator pre op: OD OS Add for N5 Right Phacoemulsification Wiol-CF IOL 5/5/05 Left Phacoemulsification Wiol -CF IOL 16/5/05 Unaided V.A. June 05 OD 6/4 OS 6/4-2 N8 N8 Patient very happy Unaided V.A. November 05 OD 6/9 OS 6/4-2 N8 N8 Right YAG capsulotomy Mr A Nylander. 3/25/2017 Case Study 2 CASE 2 - Mr. M. H. Aged 52 Taxi Driver pre op: OD OS Add for N5 Right Phacoemulsification Wiol-CF IOL 5/5/05 Left Phacomulsification Wiol -CF IOL 24/11/05 Unaided V.A. 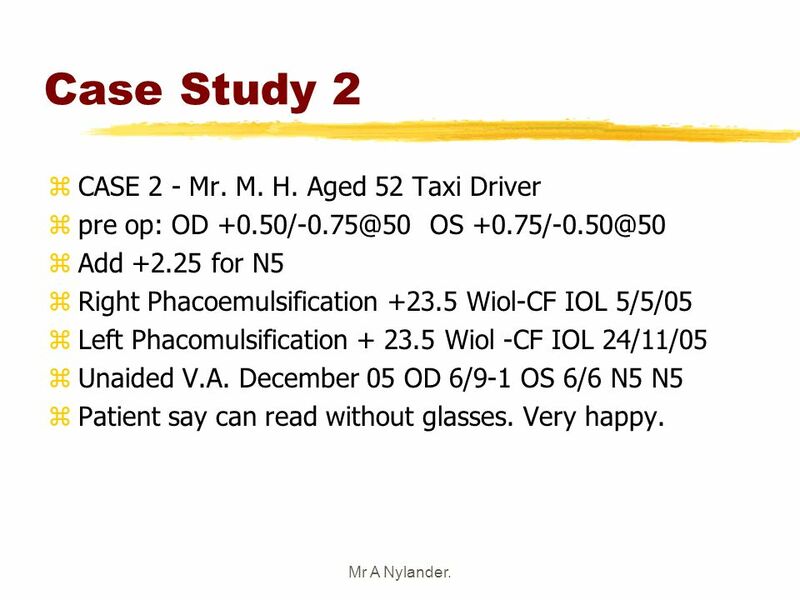 December 05 OD 6/9-1 OS 6/6 N5 N5 Patient say can read without glasses. Very happy. Mr A Nylander. 3/25/2017 Case Study 3 CASE 3 - Mrs. S.A. 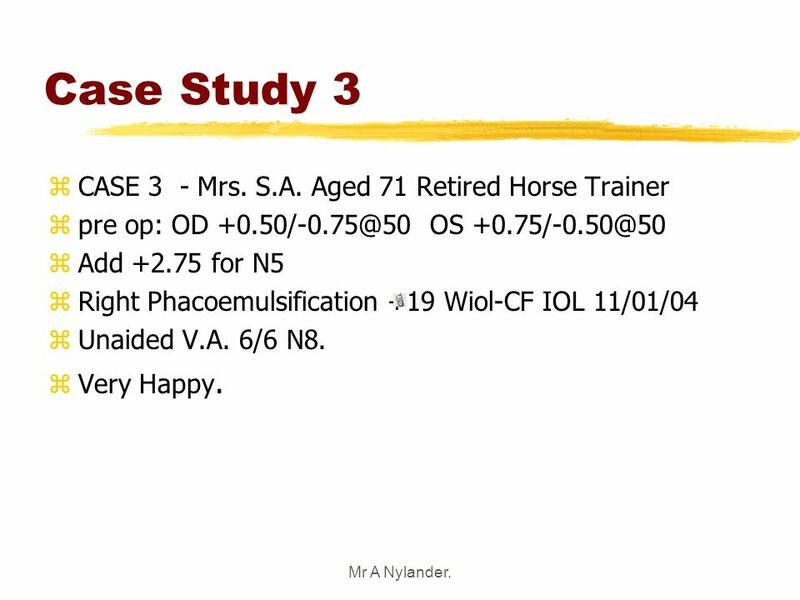 Aged 71 Retired Horse Trainer pre op: OD OS Add for N5 Right Phacoemulsification +19 Wiol-CF IOL 11/01/04 Unaided V.A. 6/6 N8. Very Happy. Mr A Nylander. 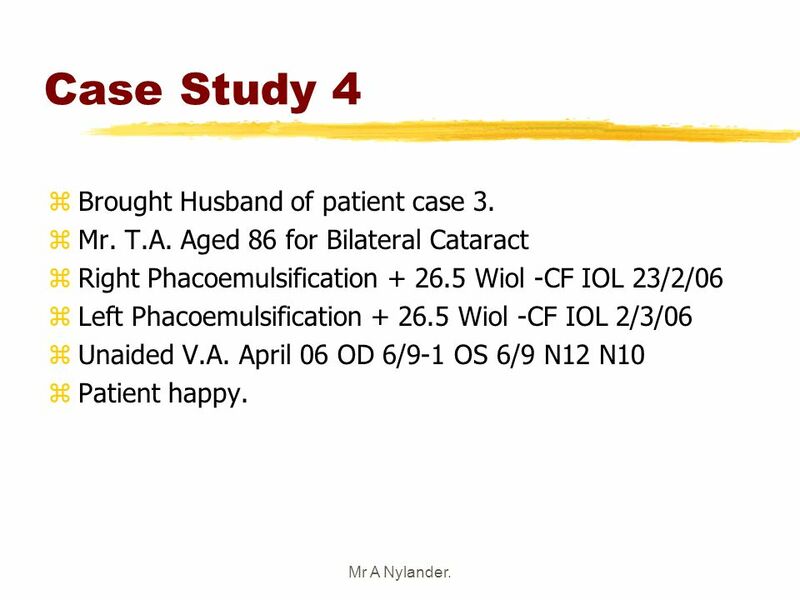 27 Case Study 4 Brought Husband of patient case 3. 3/25/2017 Case Study 4 Brought Husband of patient case 3. Mr. T.A. Aged 86 for Bilateral Cataract Right Phacoemulsification Wiol -CF IOL 23/2/06 Left Phacoemulsification Wiol -CF IOL 2/3/06 Unaided V.A. April 06 OD 6/9-1 OS 6/9 N12 N10 Patient happy. Mr A Nylander. 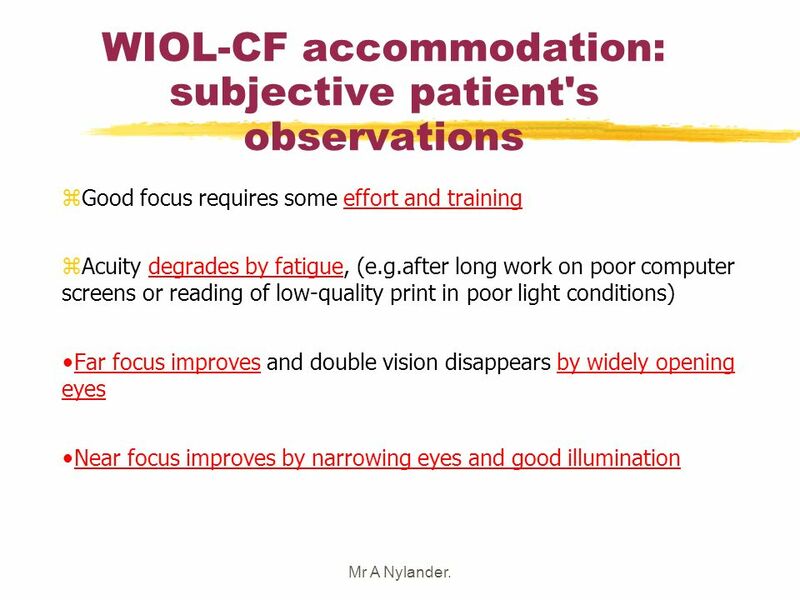 3/25/2017 WIOL-CF accommodation: subjective patient's observations Good focus requires some effort and training Acuity degrades by fatigue, (e.g.after long work on poor computer screens or reading of low-quality print in poor light conditions) Far focus improves and double vision disappears by widely opening eyes Near focus improves by narrowing eyes and good illumination In addition to the objective results presented by Professor Pasta later, I have made some subjective observations: Mr A Nylander. 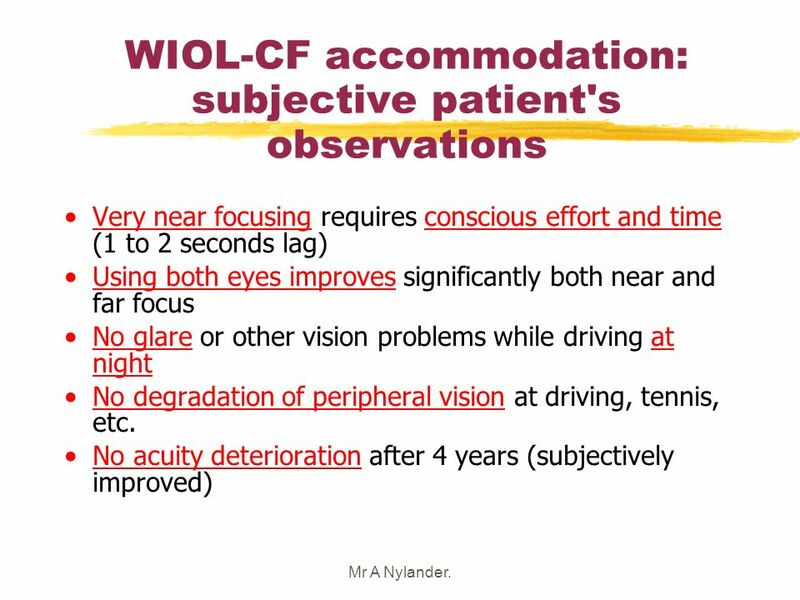 3/25/2017 WIOL-CF accommodation: subjective patient's observations Very near focusing requires conscious effort and time (1 to 2 seconds lag) Using both eyes improves significantly both near and far focus No glare or other vision problems while driving at night No degradation of peripheral vision at driving, tennis, etc. No acuity deterioration after 4 years (subjectively improved) Mr A Nylander. 30 Conclusion All patients obtained some accommodation. 3/25/2017 Conclusion All patients obtained some accommodation. Accommodation range from N12 to N5 Mostly N8. Better accommodation with 6/9 or 6/6 vision than 6/4 or 6/5. 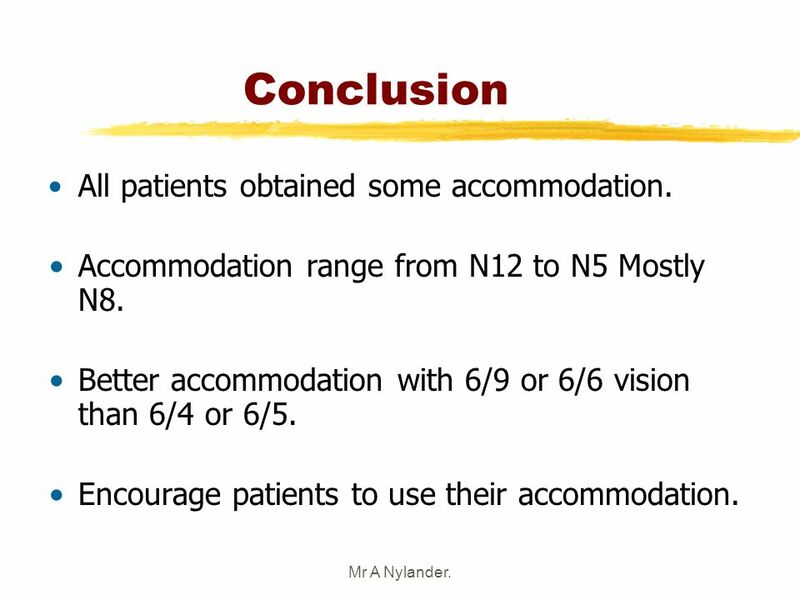 Encourage patients to use their accommodation. Mr A Nylander. 31 3/25/2017 Conclusion Older patients need more encouragement than younger patients. Correction factor appears to be accurate. PCO in 2 out of 51 cases. 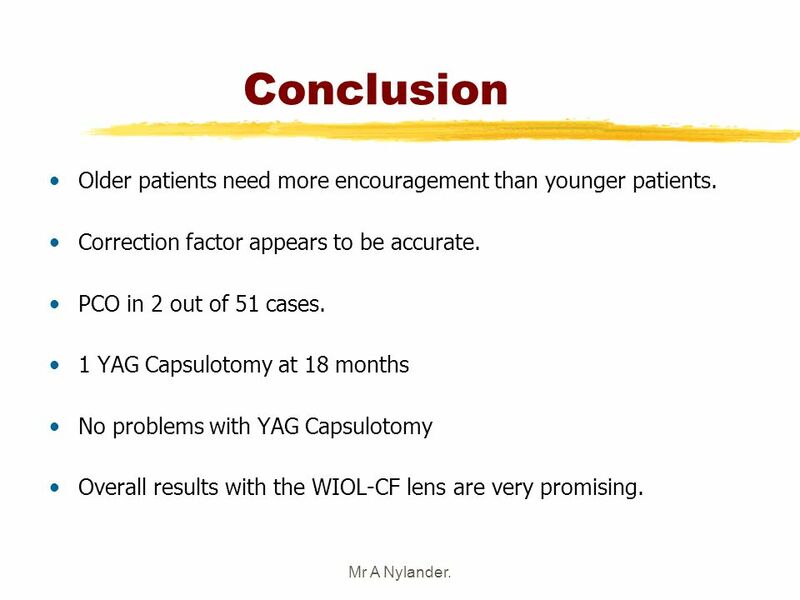 1 YAG Capsulotomy at 18 months No problems with YAG Capsulotomy Overall results with the WIOL-CF lens are very promising. Mr A Nylander. 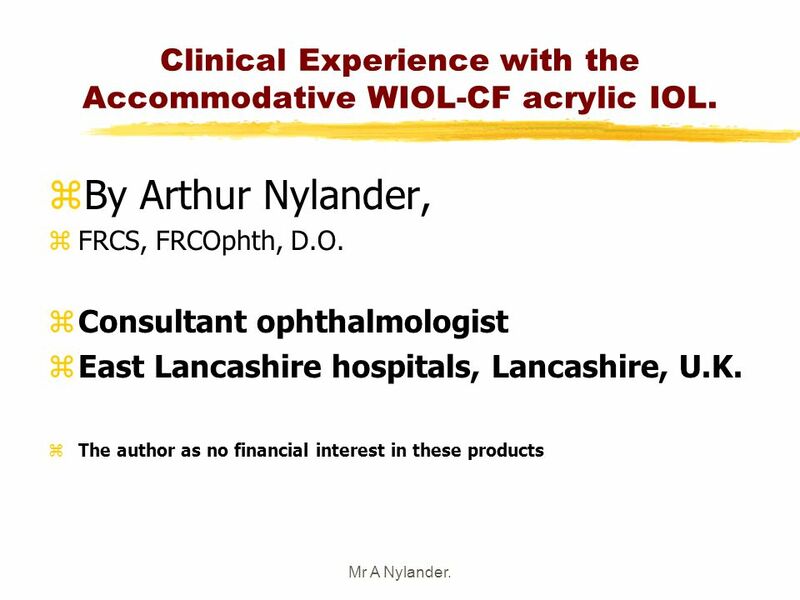 Download ppt "Clinical Experience with the Accommodative WIOL-CF acrylic IOL." EXPERIENCE WITH THE LENSTEC KH3500 TETRAFLEX LENS.